Move over, Brad Pitt. Make room, Sandra Bullock. America has a new sweetheart, and it's that teeming horde of subhuman slapstick monsters, the Minions. 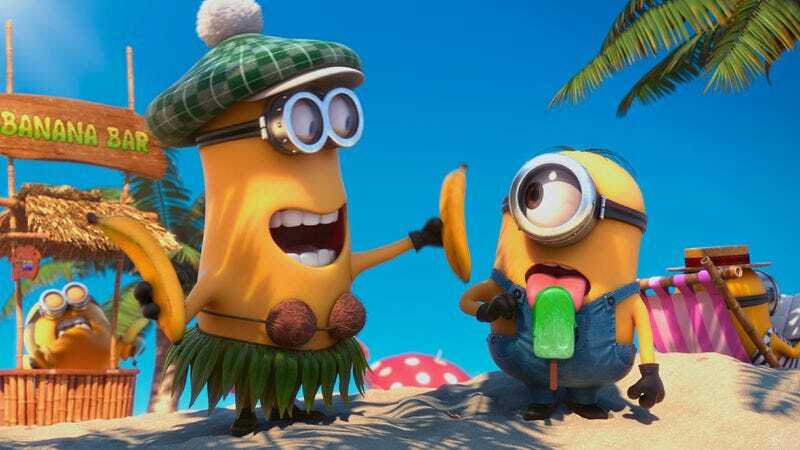 Despicable Me 2, the evidently long-awaited sequel to 2010's evidently very popular animated hit, has pulled in an unusually hefty haul of $142 million since it opened last Wednesday. That's more than Toy Story 3 made out the gate, which means that not only do moviegoers find those nattering yellow sidekicks adorable or funny or something, they also possibly prefer them to Woody, Buzz, and the gang. Compounding this confounding good news for Universal is the fact that an all-minions-all-the-time spinoff is already in the can, and ready to babysit America's children over the 2014 holiday season. Speaking of blockbuster hopefuls whose advertisements focused more on sidekick antics than the supposed star of the show, The Lone Ranger disappointed with a modest $41 million gross over the five-day sprawl. Despite the presence of bankable human cartoon Johnny Depp, who plays famous right-hand-man Tonto, this new movie based on a very old property failed to pull Pirates Of The Caribbean numbers. It's the latest misfire in a summer that seems to be producing a surprise smash (like World War Z) and a surprise flop (like White House Down) every weekend. Keeping that pattern in mind, the A.V. Club's box-office gurus have scientifically determined that next weekend's destroy-all-monsters epic Pacific Rim will underperform, while The Hunt—a Danish drama featuring Mads Mikkelsen as a teacher falsely accused of exposing himself to a child—will shock prognosticators with a $100 million opening weekend. You heard it here first. In limited-release news, the Kevin Hart standup film Let Me Explain pulled in a whopping $17.5 million on 876 screens, cracking the top five of comedy concert films. (Number one is still, deservedly, Eddie Murphy's insanely funny 1987 set, Raw.) Further down the chart, readymade summer crowd-pleaser The Way, Way Back— featuring Despicable Me 2 star Steve Carrell, as a different kind of villain and surrogate father—pleased a modest-sized crowd, scoring $575,000 on 19 screens. Those aren't indie-hit numbers, but maybe the film, like its underdog hero, just needs a little time to come out of its shell.